Cleveland Cavaliers forward LeBron James talks with referee Eli Roe during the second half against the Philadelphia 76ers at Quicken Loans Arena. Way back when training camp opened in September, the Sixers making the playoffs seemed like a pipe dream. Brett Brown and his players were clear about a postseason appearance being their primary goal, and everyone else was right to be skeptical about a team led by a rookie playmaker and several other young players. It is a pipe dream no longer. The Sixers' playoff spot was officially clinched after the Pacers beat the Miami Heat on Sunday evening, and all that's left to settle is where they'll have to travel in their attempt to win a series. Their first major domino has fallen, but as the season winds down, it's still not clear who the Sixers are going to face in a first-round series. In an Eastern Conference that has been much more competitive than most expected it to be before the season started, the 3-6 seeds are still up for grabs. Three full games separate the current No. 3 seed Cleveland Cavaliers from the No. 6 seed Washington Wizards, but the Sixers and Indiana Pacers are within a half game of Cleveland's spot. With Kyrie Irving's health in doubt, the push for the No. 3 seed has grown in stature down the stretch. The seeding battle matters for the Sixers, though it's less important than the way they're trending at the moment. They have hit their stride in the season's closing stretch, thanks to a softer schedule and the progression of their most important pieces. With Joel Embiid and Ben Simmons leading the way, flanked by the likes of Robert Covington, Dario Saric, and JJ Redick, the Sixers have the right to believe they can play with any team in the East on their best day. Even a rising team — or a true contender, for that matter — can benefit from matchup advantages. So let's preview a few of their most likely opponents in round one, ranked from "team I'd most like to play" to "team I'd least like to play". Up until the last month or so, the basketball universe was waiting for the bloom to come off of Indiana's rose. Behind a brilliant start from Victor Oladipo, the Pacers quickly flipped the perception on last summer's Paul George trade, and have earned the right to be viewed as a tough out once the regular season ends. So while they may be the most "favorable" matchup for the Sixers in the first round, that does not diminish their status as a serious threat to come out on top in seven games. Indiana has succeeded this season playing a style of basketball reminiscent of Doug Collins' tenure in Philadelphia. They rank in the bottom five in threes attempted, are the No. 1 mid-range shooting team in the league, and play one of the most cautious brands of basketball in the league. This is not an up-tempo, freewheeling team like the Sixers, but a slower, more methodical team whose goal is to capitalize on your mistakes while minimizing their own. While in theory that sounds like a mismatch for a Sixers team that can be mistake prone, there is a limit to which that strategy can work in a playoff format. The game gets a lot more physical in the playoffs, and officials let things go that they don't in the regular season. Driving and passing lanes close quicker and post-ups are harder to establish, which necessitates risk-taking that can make players feel uncomfortable. If you're playing what amounts to a ball-control offense, you better have elite talent to execute, and past Oladipo the work is done by committee. Indiana is also the team least capable of capitalizing on the wonkiness of Philadelphia's starting lineup. Darren Collison is a perfectly serviceable starting point guard, but he is not the sort of player who would give Ben Simmons trouble on defense. With Simmons able to handle the point-guard defense, Covington is free to check Oladipo, who he did a great job of limiting during the regular season — according to data provided to the NBA by Second Spectrum, Oladipo shot just 11/32 from the field while guarded by Covington in the regular season, a 12 percentage-point drop from his season average. Simmons' ability to distort lineups can potentially hit Indiana harder on the other end of the floor. The Sixers have made a concerted effort to get Simmons more touches in the post over the last month or two, and smaller defenders are at a major disadvantage down there. In their meeting with Indiana early in the season, Simmons bludgeoned both of Collison and Oladipo on the block. That said, Simmons has been limited against the Pacers as a scorer despite averaging a near triple-double against them in the three games they've played. After finding early success agains Indiana's smaller players, the Pacers have opted to guard him primarily with either Thaddeus Young or Bojan Bogdanovic, and he has shot just 36.1 percent against Indiana for the season. The Sixers don't need him to be a dominant scorer, but he has to finish at the rim at a moderately-high clip in order to get a win. The primary concern on Philadelphia's end beyond the stylistic clash would be how Myles Turner can tilt the court for the Pacers on offense. Though Covington and Simmons have been defensive weapons in their own right, Embiid is the catalyst for Philadelphia's defensive success. If he has to chase a big man out to the perimeter all game, Philadelphia's rotations and ball denial behind him have to be crisp. Nothing about this would come easy, but top to bottom the Sixers have more talent than the Pacers, and shortened rotations would benefit the Sixers more than their opponent. There's an argument to be made the Wizards are the opponent the Sixers should least want to play in the first round. Though they don't have an all-time great on their roster, Washington has more of a concrete identity than Cleveland, who is trying to piece things together on the fly with what's basically a brand-new roster. It's also fairly difficult to use the regular season as a template for anything we'd see in a head-to-head battle between the Wizards and Sixers. The first game between the two teams came on opening night, with the Sixers sporting a new roster and a No. 1 overall pick whose shot had gone M.I.A. In the three games that followed, John Wall was unavailable for Washington, and his presence is by far the biggest X-factor in a potential matchup. Throughout the season, Brett Brown has harped on the fact that Simmons' toughest matchups at the point guard position are two archetypes he has nicknames for: "waterbugs" and "roadrunners." The former is a player like Kemba Walker — small, shifty, and quick with the handle. Wall is the latter, a speed demon who has few peers when he takes a rebound and attacks in the open court. With Wall in the lineup, the Wizards can force matchup problems for the Sixers. If you stick Simmons and Covington on Wall and Beal, JJ Redick is forced to deal with Otto Porter. Washington's swingman isn't anything special as an isolation scorer, but Redick is giving up roughly half a foot in that matchup, and overhelping killed the Sixers against Washington without Wall. Though Washington plays a more "traditional" starting lineup with Philly native Markieff Morris at the power forward spot, Kelly Oubre's emergence as a legitimate contributor has changed the face of their bench. The Sixers tend to deal poorly when teams can bring athleticism and shooting off the bench, and that problem has only gotten worse with the addition of a perimeter turnstile in Marco Belinelli. The Wizards have been able to play four out with Marcin Gortat as a screener/roller, and Beal's dribble penetration had Philadelphia on tilt in their February loss on national TV. But just as Philadelphia would have to prepare for Wall's return, so does Washington. They have played without him so often this season that they have adjusted to lineup combinations that will suddenly disappear or be diminished once he's back. That four out style we just mentioned? It doesn't work with Wall on the floor, and the Sixers can use his shooting weaknesses against Washington. If you're looking for a positive or a matchup to exploit for the Sixers, look no further than Embiid. The Wizards have actually done a decent job of limiting his effectiveness as a shooter, but he has brutalized them when he's decided to put his head down and go to work on the block. Embiid averaged 8.25 free throws per game against the Wizards this season, and Ian Mahinmi is dog food when Washington turns to their backups. The Wizards play feisty, physical basketball, and whether or not the young Sixers could answer the bell is up for debate. They are more battle-tested than Indiana, and the dual perimeter stars would make life miserable for the defense. This would not be a fun series for Sixers fans to watch, I imagine. After everything you read above about the Wizards, you're within your right to consider them the toughest (likely) out for the Sixers in round one. But at the end of the day, they don't have LeBron James on their team, and that's why the Cavs are at the bottom of the preference list. In most instances, you are what your regular season performance says you are. The Sixers are a young team with elite capabilities and a low floor. The Celtics are tough, defensive team that relies far too heavily on Kyrie Iving to create offense out of nothing. And the Raptors are the class of the conference, despite playoff demons that have haunted them for years. But the same does not hold true for a LeBron James team. Yes, this is probably the most vulnerable he has been in the Eastern Conference since he left for the Miami Heat in 2010. 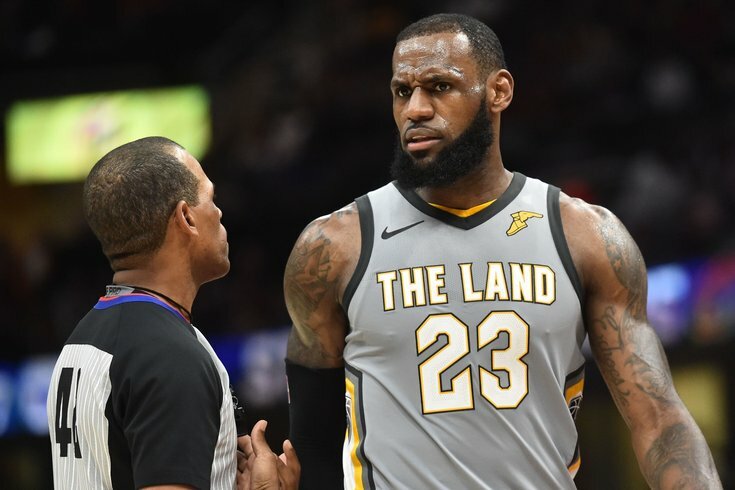 The Cavs would have to defy convention to succeed in the playoffs — they are one of the worst defensive teams in the league, ahead of only the lowly Sacramento Kings and Phoenix Suns on a per-possession basis. Though the Cavs have ultimately played a bit better since the trade deadline, their defensive efficiency has actually been worse in February and March than it was earlier this season. Cleveland is not going to become an elite defensive team overnight, but while you could make the case for Embiid as the best player in either of the other two theoretical series, you can't do so here. NBA history is littered with evidence that sometimes that's all that really matters when push comes to shove. Because of LeBron's presence — in addition to help from Kevin Love and the various shooters that populate the roster — Cleveland has a level they can get to that we really haven't seen yet. Or at least, we haven't seen it much this season, because LeBron's playoff exploits are etched in stone at this point. He hasn't gone to seven straight NBA Finals with two different franchises on accident. If the Sixers were to find themselves toe-to-toe with the Cavs, it would be up to Embiid to quarterback the offense and exploit Cleveland's undersized frontline as both a scorer and a passer. Because they're so undersized up front, the Cavs are aggressive sending doubles at players like Embiid in the post, and he sent Cleveland into scramble mode a few times during their last meeting. And while LeBron is the best player in a theoretical matchup, Embiid has the potential the shift the series with defense in ways the veteran forward cannot. Cleveland's bigs have shown a reluctance to attack him at the rim even when they're in an advantageous position, and when you combine that with Embiid's switchability in late-clock situations, it makes life miserable for the Cavs. Cut the legs out from their offense, and they are left with nothing to fall back on. Cleveland's newness as a unit would give Philadelphia a leg up in the continuity department, which should not be understated. Outside of a few holdovers, the Cavs have very little collective experience to fall back on, and you never know how a group like that will respond to getting punched in the mouth (metaphorically, of course). The Sixers, who have been on a roller coaster ride of their own this season, appear to have emerged from the blown leads and overall struggle as a better team on the other side. But if death and taxes are the only certainties in life, the San Antonio Spurs and LeBron James are as close as it gets in the basketball world. The switch will be flipped, he will be a terror on both ends, and the Sixers would be better off hoping someone else dethrones him before they have to play him.